• Cost-saving. First and foremost, you save your money; on fuel, on public transportation etc which you otherwise spend unnecessarily on to-and-fro visits to the outlet. • Time-saving. But of course. And time, as they say, is money. • Round-the-clock ordering. Time is no bar when you’re placing your orders online. You’re free to do it at 3 am or 3 pm, totally your call. • Exclusive deals and discounts. Another one of those factors that come into play when you place your orders online. At any given time, there are numerous offers going on which will again save your money and get you a good deal. • Delivery at your doorstep. Yes, you don’t need to step out of home either. Very convenient and hassle-free. With Online Food Ordering Apps making their way into the market, getting home delivery of food has taken on an entirely new meaning. And when it comes to getting food home delivered, then of course the obvious choice is the restaurant next door. What if you could find the menus of all the restaurants that will deliver in your area and could pick and choose the items you want sitting comfortably at home? What if there was North Indian, South Indian, Chinese, Japanese and even cakes and sweets that you could order online and get home delivered? 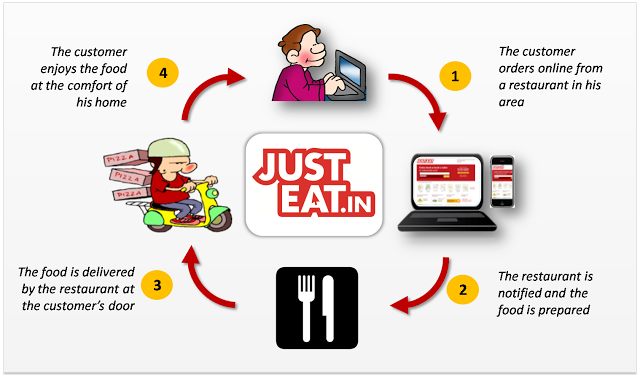 And best of all, what if you could just pay online for your food as well and not bother about sorting out the exact change when the delivery boy rings your doorbell? JUSTEAT India – India’s largest online food ordering portal and table reservation website – has made all this and more possible. Once on the homepage, you see a search box at the top which is very helpful and will lead you to the restaurant of your choice. You could use this in three ways. One, if you know exactly which restaurant you want to order from, type in the name of the restaurant in the box. Click on ‘Search’ and you’ll probably get your restaurant at the top of a list of several other similar restaurants. Two, you could type in the cuisine you would like. For example, if I am looking for Chinese cuisine among the Restaurants in Bangalore, I get a list of all restaurants that serve Chinese fare and I can then filter the list based on my location. And last but not the least, you could enter your location in the search box (this I feel is by far the most convenient option). You get a list of all restaurants in your area and can then choose which cuisine or restaurant to go for. So there! 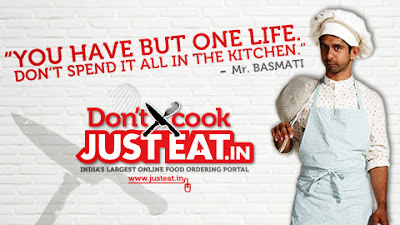 Very convenient, a huge amount of choice and timely delivery – now isn’t that a complete package for every foodie? Now for the fun part. 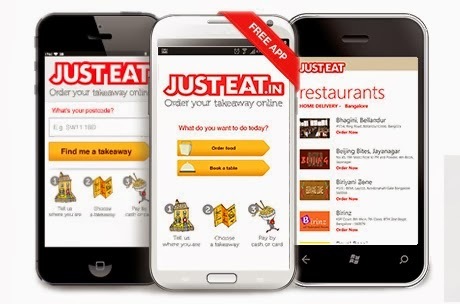 Just Eat India is giving away JUSTEAT coupons worth Rs.200/- for four of my readers. All you need to do is enter in the below Rafflecopter widget. Here are the rules. > These coupon codes entitle you to food worth 200/- for FREE. > Valid on all online payment restaurants in Bangalore, Delhi, Mumbai, Pune and Chennai. > Select your location from the 'Choose Location' drop-down menu at the top of the page to get a list of restaurants that deliver in your area and take your pick. Minimum order amount should be atleast 400/- (can be more as well. For example, if your total order amount comes to 400/-, then 200/- worth of food you get free and you'll be paying just Re.200/-. If the order amount is 500/-, then you'll be paying just 300/- and so on). This means that a minimum amount of Rs.400/- needs to be paid to avail this 200/- Off voucher. > The coupons can be used just once and are valid till January 15, 2014. > These coupons are valid only through India. 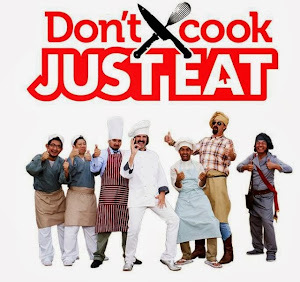 > The contest runs from today to the 23rd of December just in time for your Christmas dinner. Not in India, don't worry, enter to win and order restaurant dishes to surprise your loved ones in Bangalore, Delhi, Mumbai, Pune and Chennai or give coupons to friends who are living in the above mentioned cities. Now isn't that worth a try. Do go ahead and send in your entries. Good giveaway :) Happy hosting! It's really amazing contest. I also like the contest.